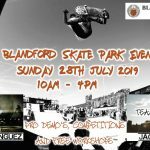 Five Bridges Plaza is a simple concrete skatepark that can be found under the 5 Bridges roundabout on the Gateshead Highway. It is made up of concrete obstacles and has solely a street focus. 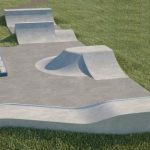 The skatepark starts on one side with a long, angular flat bank which opens up onto a flat area with a series of rails and ledges. After these is a manny pad, bench and a kicker to high ledge and on the back side is a two tiered ledge as well. There is also a mini ramp on the back side as well with a small extension. 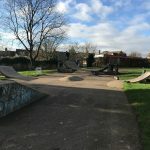 5 Bridges Plaza is a nice local spot with some basic obstacles, the surfaces are smooth and it is undercover making it a great place to come on a wet day. It is a popular spot with the locals as well so get yourself down here if you are in the area. Gateshead Stadium metro station: Exit the metro station onto Shelley Drive and follow the road until the end where it meets Sunderland Road. Here turn right onto the road and follow it to the roundabout and 5 Bridges skatepark will be under here. Cemetry Road bus stop: Exit the bus onto Old Durham Road and head north until the roundabout. Five Bridges Plaza will be here.